Windows 8 was released a little under a month ago, but already many developers are adding applications to the Windows store. According toWin App Update, over 20,000 apps have been added to the Windows store. Exact numbers cannot be ascertained, as the numbers are different where you live and they are going up every couple of minutes. Weirdly, the highest amount seems to be in Canada, with around 14,000 apps compatible there, while the US has 13,000 and the UK has 11,000. 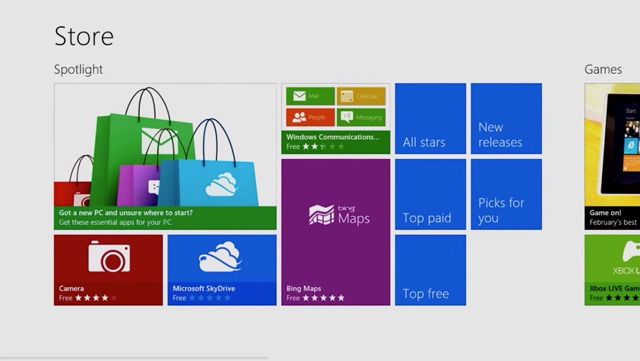 Around 90% of all these apps are free, with Win App Update saying there are 18,000 free apps on the Windows Store. This is good, but shows that Windows Store may still need to be matured and monetized for developers that want to make money. Looking at the numbers, developers are adding between 500 – 350 apps per day to the Windows Store, a decent amount considering how new the operating system is. In addition, we have seen recently that the conversion from other Windows platforms to Windows 8 has been slower than Windows 7, which may have put off some developers. At the rate we are seeing, the Windows Store may be up to 35,000 apps by the end of the year, possibly more with the holiday season plunge. Developers may be waiting to grab the buyers once they are settled in to their new OS and start to use the store more frequently. Looking at Christmas lists, while Windows 8 tablets and laptops are not hitting the top of the lists, they are certainly there. If hundreds of thousands of laptops and tablets are sold with Windows 8 on, then developers may be swayed to add their content to that store. The Windows Store, while packed, does not have tons of quality – we are seeing measly apps that would not even get past the Apple review process hitting the top of the leaderboards, simply because of the inflation. Hopefully, Microsoft will be working on harder reviewing to make their apps.